Moving beyond its smartphone and tablet offerings, LG has today unveiled its new Game World portal for its 3D Smart TV lineup, offering a selection of 2D and 3D titles that can be played with either the company’s Magic Remote or any third-party gamepad. 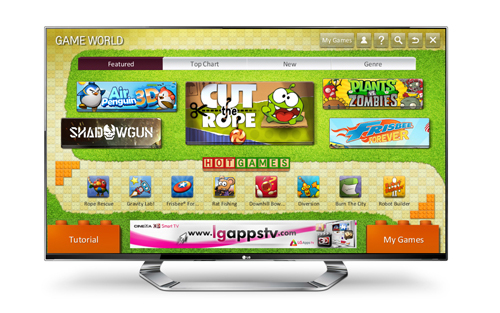 Already offering apps via its Smart World portal (more specifically, its LG Apps TV marketplace), LG lists games developed exclusively for its Cinema 3D Smart TVs, grouping them into Featured, Top Chart, New and Genre categories, allowing owners to quickly search and purchase new titles on its store. Downloaded games are listed in a dedicated ‘My Games’ section, with tutorials, manuals and instructions available for living room gamers that need some assistance playing TV-specific apps using their Magic Remote, or need help pairing a separate controller. The store appears to already feature Cut The Rope and Plants vs Zombies, but the full selection will be available when it launches globally later this year.